The objective of the Clinical Laboratory Improvement Amendments (CLIA) program is to ensure quality medical laboratory testing, which leads to better patient outcomes. The Center for Medicare Services (CMS) Central Office is ultimately responsible for the effective administration of the CLIA program. CLIA has no direct Medicare or Medicaid program responsibilities although all clinical laboratories must be duly certified to receive payments from the CMS. The quality standards set by CLIA are maintained by the accreditation and inspection processes along with proficiency testing. Accreditation requires clinical laboratories to be certificated by their state and CMS prior to accepting human samples for diagnostic testing. However, compliance is driven by continuing inspections and proficiency testing. Preparing for a CLIA inspection requires attention to the laboratory’s implementation and documentation of procedures and processes that are essential to accurate diagnosis. Proficiency testing and the biennial inspections mandated by CLIA provide the framework for developing procedures and processes that enable the laboratory to be in a continuous state of compliance. In general terms, CLIA regulations establish quality standards for laboratory testing performed on specimens from humans, such as blood, body fluid, and tissue, for diagnosis, prevention, or treatment of disease, or assessment of health. CLIA regulations are now arranged to match the path a patient specimen takes as it moves through the laboratory; i.e., specimen receiving (pre-analytic), testing (analytic), and result reporting (post-analytic) phases. This global overview of the process forces the laboratorian to focus beyond the test itself, and on the critical elements involved in getting the right results to the right patient. It is well documented that most laboratory errors occur in the pre- and post-analytic phases, while less than 10 percent of all errors in clinical laboratories occur in the testing phase. The pre-analytic phase is the most vulnerable part of the total testing process and is considered to be among the most significant challenges to the laboratory professionals. Errors can occur at the time of patient assessment, test order entry, request completion, patient identification, specimen collection, specimen transport, or specimen receipt in the laboratory. In a study of preanalytic errors, 47 percent of the errors were due to inadequate sample quality followed by wrong patient identification (26.8 percent), a missing physician order (14 percent), inappropriate sample quantity (11.6 percent), and inappropriate container (0.6 percent). While management of specimens and policies external to the laboratory are not fully standardized, protocols for sample collection, transportation and handling are available. 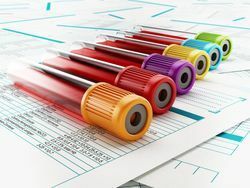 In addition to meeting CLIA requirements, preanalytical errors can also be avoided by automating support and administrative operations and enhancing the communication between the laboratory and healthcare providers. The analytic phase begins when the patient specimen is prepared for testing and ends when the test result is interpreted and verified. 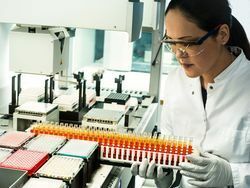 Advances in analytical techniques, laboratory instrumentation, and automation have improved analytical quality resulting in a significant decrease in error rates. Nonetheless, analytical quality is still a significant issue. Improper sample preparation or the presence of interfering substances (e.g., hemolysis, lipids) can affect test results. Establishing and verifying test method performance specifications as to test accuracy, precision, sensitivity, specificity, and linearity are a hedge against unrecognized analytical errors. establish and maintain written policy, process, and procedure manuals. provide training and perform competency evaluations of personnel. participate in a proficiency testing program appropriate for their test menu and specialties. verify Instrument performance and track instrument calibration and maintenance. maintain records of the laboratory environment (e.g., temperature, humidity, refrigeration). Many CLIA labs use a pro forma—a fill-in-the-blank form that captures real-time information regarding reagent preparation, instrumentation, incubation times, analyst, and other items that can maximize reproducibility or provide insight into what caused a test to fail. In the post-analytic phase, results are reviewed and released to the clinician, who interprets them and makes diagnostic and therapeutic decisions. 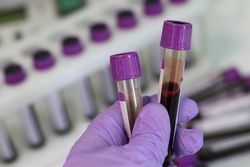 Timeliness and the incorrect interpretation of diagnostic or laboratory tests were responsible for a significant percentage of errors in ambulatory and emergency department settings. The significant contributions to errors in the post-analytic phase are a failure in reporting, erroneous validation of analytical data, and incorrect data entry. generate Levy-Jennings or trend plots of QC results to identify changes in test performance. reduce human error through root-cause analysis, process control, and education/communication. Each year medical laboratories generate a large volume of critical data used for patient diagnosis and treatment. Their ultimate goal is to provide a timely and error-free service to physicians and their patients. As indicated above, the importance of extra-analytical aspects in laboratory quality is encompassed in compliance with CLIA regulations. CLIA compliance addresses the total testing process (TTP), wherein all phases of the testing cycle are assessed, monitored, and improved in order to decrease error rates and improve patient safety.